“Ready Player One” takes it all! Trouble in paradise when you have second thoughts about this film. Well, my point is you should take a ride to the see the big screen. This film marks the return of Director Steven Spielberg who, after helming 2017’s The Post, creates an over-the-top, anticipating film of the decade and serve as a grabber from the book, Ready Player One, written by Ernest Cline. What better ways to make a very hard science-fiction film the greatest film in history (I would say this film is the best Spielberg-directing film since Jurassic Park, produced in 1993). Nothing could ever punch that film with awesome balance compared to Indiana Jones series, Jurassic Park, War of the Worlds, The Adventures of Tintin, and his executively-produced film, Back to The Future. Spielberg gave a fast-track offering to adult and teenage audiences that would get their eyes peeled for memories from the 1980s and 1990s. The film, inspired from the book, have gone so many levels that trails upon the crossover worlds of pop culture (this is like 1988’s Who Framed Roger Rabbit style, but in the virtual reality) and the plot as an advantage for science-fiction genres. The stunning background, the characters, the Easter eggs, some special effects, and the direction are nicely done for the film’s performance. Temple Run games and James Cameron’s Avatar heavily influence the film’s background. As a moviegoer, I was heavily intrigued by the usages of pop culture and inside jokes as these things flew over my head to study what values this film have brought up in decades. 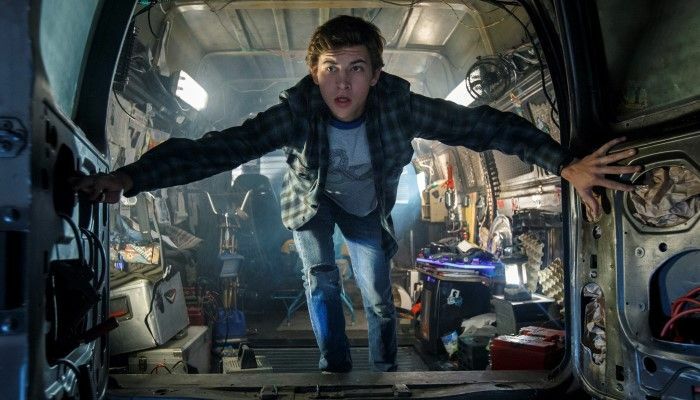 Due to extensive use of pop culture, Ready Player One tops their priorities just like Marvel films (Stan Lee’s cameos), Pixar films (A113, Pizza Planet truck, Pixar ball, and John Ratzenberger), and other films (take Wreck-It Ralph for example). Believe me, I seen every films Marvel and Pixar have done in the past and present. The entire cast did a bang-up job on their adventurous roles. 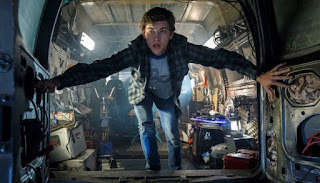 This includes Texas-born actor Tye Sheridan, playing his avatar Parzival, and Olivia Cooke who served as the main attention getters of this film while Ben Mendelsohn, T.J. Miller, Simon Pegg, and Mark Rylance served as supporting characters. Mark Rylance recently collaborated with Spielberg in The Bridge of Spies, for which he won an Oscar for Best Supporting Actor, and Disney’s The BFG. The music is well done and is composed by Alan Silvestri, who rarely worked with Spielberg. Spielberg collaborated with John Williams on most of his movies, but for this film, he made a different choice to choose Silvestri, who famously worked on The Avengers films and Robert Zemekis films (includes Back to the Future and Who Framed Roger Rabbit?). Reason number one was I mistook William’s scoring somewhat (my percentage for this is 15 percent). However, I was a bit annoyed when the film overused a little too much special effects and not providing the good, thoughtful character development. It was a shame that actors could not keep up with their parts seriously under Spielberg’s direction. Every actor has to have a solid head start before taking over the course of action. My main answer is that action sequences are the main roots to digest throughout the film instead creating ideas for character development. Looks like Spielberg need to fill the gas in the car (or the DeLorean) before something bad happens. For my experiences, this film is like going to comic conventions (or Comic Con for short) and anime conventions where many people and fans cosplay their favorite characters from any fictional shows, movies, and other media that brings the 1980s or 1990s fashion to public’s presence. I only went there just to meet-and-greet celebrities in town. I’m not a party-pooper for cosplaying, but as a film critic or press, I took my role seriously. The rail tracks have switched! Anyways, this is a pretty good film, though not topping over Jurassic Park or Indiana Jones, as the film brought some interesting viewpoints to the style and the parodies from other films you have enjoyed the most. I have a feeling this film can be considered the best films of 2018. Kids, however, would have some disagreements on this but for teens; they just simply run into the movie theater and watch this bad boy. Think about “Out with the Old, In with the New” meaning, you can watch this to reimagine your memories from the 1980s, 1990s, and 2000s. For any films to watch, avoid the choices: A Wrinkle in Time, Pacific Rim Uprising, and Peter Rabbit. Although, you need to save your money (and energy) for the upcoming Avengers: Infinity War coming up in a month. To make this a fair game, I highly recommend watching this twice and wait for the DVD release.